It's been hard on my heart as we head into this holiday season to know exactly how to honor our sweet Missy. I want to still celebrate Christmas, but I also feel this desire to take time to acknowledge my amazing baby sister who isn't here with us this year... I just hadn't thought of a way to do that. Lucky for me, groups like Compassionate Friends exists, and they have thought of a way to embrace those we have lost, and have set aside a time to come together in love, in grief, and in support. 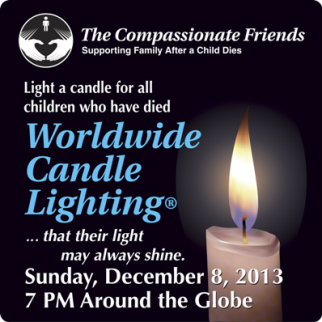 Annually, on the Sunday in December, there is a worldwide candle lighting ceremony that takes place to honor our lost loved ones. There are places you can meet and have the ceremony together, or you can just take a minute in your own home to light a candle at 7pm that night and think of those who are lost, and those who are here missing them so terribly this holiday season. 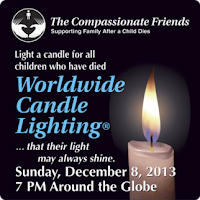 Our family is going to our local Compassionate Friends candle lighting ceremony. If you live local and loved our sweet Missy, or have lost someone else you want to honor with a candle, you are welcome to join us. If you do not live local, or just can't make it to the meeting, but would like to light a candle in her honor, or the honor of others you have loved and lost, please do so. If you send me a picture, I will share them with my family. If I get many photographs I will compile then on Monday into a blog post for everyone to see and feel the love and support. You can email pictures to biogirl79(at)gmail(dot)com , or if you post on Twitter, FB or Instagram just hashtag it with #CandlesForMissy . Hey Sarah, thinking of you guys this holiday season. I had a conversation the other day with one of my co-workers who lost her 12 year-old son several years ago about how they cope through the holidays. She was telling me how she was so upset over what to do with his stocking that first year. She couldn't not hang it up, but it would be heartbreaking to leave it empty while filling the rest. She decided all the family members would write a note to him in their own time and put it in the stocking, then on Christmas morning, they put the notes in the fireplace to send the messages up to him in heaven. Just thought that was a really nice idea, and thought maybe if your mom was having the same struggle you could suggest this. Hope it helps!